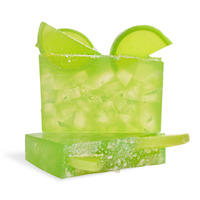 This soap looks just like a margarita - even down to the salt on top of the glass. The fragrance of margarita lime is very light and refreshing. For Limes: In 2 small glass bowls or plastic beakers, mix 1 oz. of glycerin with 1/4 teaspoon of Matte Woodland Green pigment powder. Mix 1 oz. glycerin and 1/4 teaspoon Neon Laser Lemon dye powder. Before turning on the mini-mixer, gently blend powder into glycerin by hand. Once powder is wet, turn on mini-mixer and blend until all powder dye is dissolved. This will prevent powder from becoming airborne. Weigh 2 oz. of Extra Clear soap base and place in glass measuring cup. Heat soap in microwave until it has melted. Add 1/4 teaspoon Sparkle White Snow Mica Powder and stir. To white soap, add a small amount of Matte Woodland Green. Add enough lemon color to get a nice lime shade. Pour soap into bottom of loaf mold. Spritz with alcohol to dissolve surface bubbles. Allow to set up. Once soap has set, carefully remove from mold. Cut into strips that are 5" long and 3/4" wide. These will be the rind and peel for the lime slices. You will only need 4 lime slices which are cut into 6 thinner slices per lime. Melt about 2 oz. of Extra Clear soap base in microwave. Taking the Round-Guest-Silicone mold, working one cavity at at time, pour just enough clear soap to cover the bottom. Working quickly, take one lime rind strip and spritz an edge of the strip with alcohol. Place the strip (alcohol-side down) into the melted clear soap, lining the circumference of the cavity with it. Spritz again with alcohol. Repeat this step with 3 additional soap cavities. Melt 4 oz. of clear soap. Add same mixture of woodland green/lemon yellow color to make lime shade. Blend in well. Add 2.5 ml of Margarita Lime fragrance oil and mix. 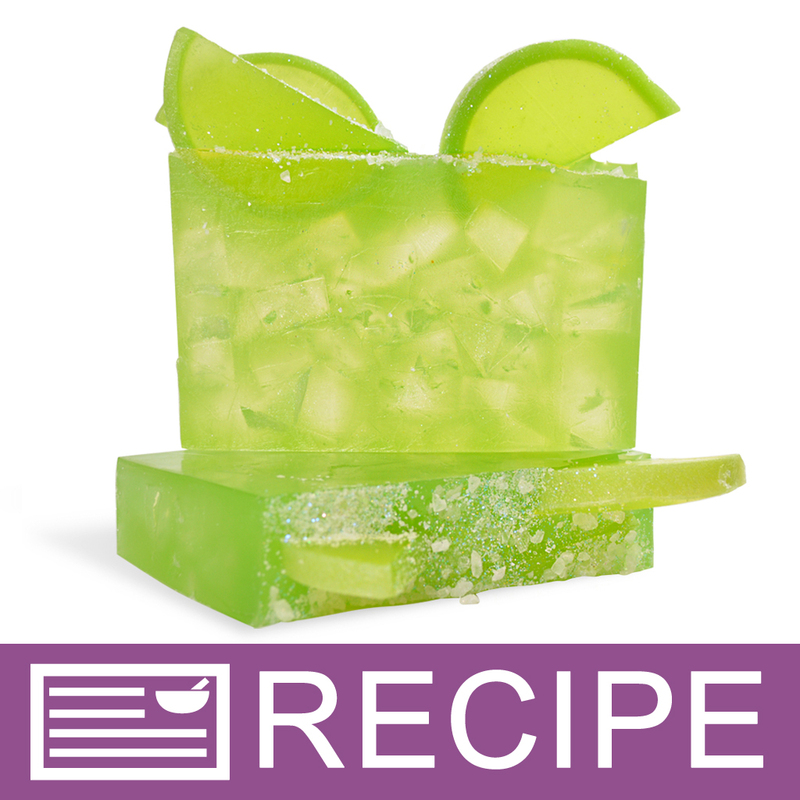 Spritz inside of each cavity and pour melted lime green soap into each. Spritz tops of each to release air bubbles. Allow to set. Once limes have set up, remove from mold. Cut each slice in half diagonally. Taking one half, stand on end (flat side down) and slice into thirds. Repeat with other half. Continue until all limes have been cut into 6 slices. There should be a total of 24 lime slices. For Ice Cubes: Cut up 16 oz. of extra clear MP soap and place in glass measuring cup. Heat in microwave until melted. Add just a pinch of White Sparkle Mica to give ice cubes an opaque look. Add .5 oz. of Margarita Lime fragrance oil and mix well. Pour into Silicone Loaf mold and spritz top with alcohol. Let soap set up. Once soap has completely hardened, carefully remove from mold. Cut soap up into small pieces to look like crushed ice. Reserve about 1/2 cup for top of soap. Weigh and cup up 25 ounces of clear soap. Heat in microwave until melted. To melted soap, first add Neon Laser Lemon mixture. Then add small amount of Matte Woodland Green mixture to create a lime color. Add .75 oz. of Margarita Lime fragrance and mix well. Into bottom of loaf mold, pour enough lime soap to cover bottom and spritz with alcohol. Generously spritz ice cubes with alcohol and place into mold. 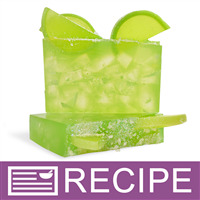 Pour lime green soap over chopped ice. Do not pour all the way to the top. You will need to leave room for the lime slices and salt on top of loaf. When soap sets up a bit and starts to thicken, place lime slices into soap. They should suspend in the top of loaf. Be sure part of the slice is sticking out of the top. While soap is setting up, mix 2 tablespoons of European Salt Blend with 1 tablespoon of iridescent glitter. Spritz salt with alcohol generously while mixing with glitter. Once loaf has hardened, melt 1 oz. of clear soap in microwave. Pour a thin layer over the top of loaf. Sprinkle crushed ice over the top and follow with the salt/mica mxture. If topping is too loose, sprinkle a little more melted clear soap on top. Once completely hardened, remove from mold. Using mitre box, if available, slice soap with soap cutter. Loaf should yield 8-1 inch slices. Wrap soap tightly with plastic wrap or shrink bags. Label accordingly.